Are you struggling with a fear of failure and strong competitiveness? Bloodstone is the perfect crystal for you! This crystal is a quartz-based mineral and though the color looks black sometimes, it is in fact dark green. The silicate inclusions on the crystal give the signature appearance of blood spots, hence the name of the gem. This precious gem dispels negative thought patterns and turns it into a productive and creative energy—crucial in case your competitive side overtakes. 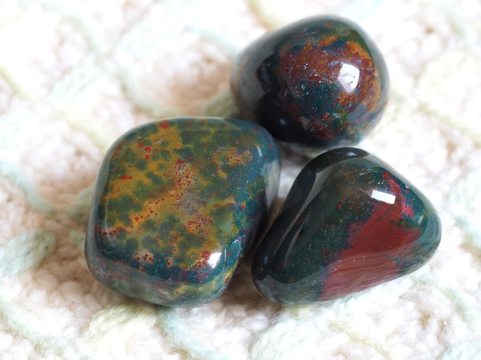 Bloodstone also stimulates self-consciousness, control, and balance. It has a strong effect on the Root Chakra and the Heart chakra, which is why the Bloodstone can neutralize your body and therefore ground and balance your strong feelings of fear and competitiveness. On the physical level, it has a positive effect on the liver, kidneys, and the bladder. But also on the immune and lymphatic system. With Mars as the ruling planet, Aries are naturally more headstrong and competitive than others. Such a fiery personality indeed provides great leadership qualities; however, your competitive advantage also comes with a disadvantage. Fear of failure and the constant want to be the best can wear you out. This is why it is important to balance out your positive and negative qualities. The Bloodstone is the perfect healing crystal for your warrior spirit! Since it stimulates your self-consciousness, which is much needed for the impulsive and headstrong nature of Aries. Because of its unique appearance, the bloodstone has been a part of various myths. During the Middle Ages, it was believed that the bloodstone harnessed sacred power. The blood of Christ supposedly dripped onto the dark green earth that turned into a stone. This led to the belief that the bloodstone was formed at the crucifixion of Christ. However, the bloodstone was a valuable crystal long before. During the Antiquity, the crystal went by the name of heliotrope which is Greek for “solstice”. It was commonly believed to be linked to blood and used for its healing properties such as detoxification. Ancient warriors would wear Heliotrope as a talisman of protection and courage. However, Heliotrope, ground and mixed with honey, was also carried in order to draw out snake venom, cure tumors, and stop hemorrhages. Though you don’t have to carry the crystal to draw out venom nowadays, this precious gem dispels negative thought patterns and turns it into a productive and creative energy—crucial in case your competitive nature overtakes.